A cell is the smallest unit of a freely living system. Our understanding of cells is measured by our ability to predict cellular behaviours in response to environmental changes and genetic manipulations. Traditionally, researchers strive to gain insights into cellular behaviours through characterizing their underlying molecular interactions. This ‘bottom-up’ approach, however, requires a macroscopic number of largely inaccessible parameters in order to be predictive. Prof. Hwa will describe a complementary ‘top-down’ approach based on quantitative phenomenology. Extensive quantitative experiments establish that the model bacterium Esherichia coli organizes many of its behavioural responses in very simple manners in accordance with the rate of cell growth. The existence of these simple empirical relations (growth laws) despite myriads of complex molecular interactions is a striking manifestation of a tremendous degree of dimensional reduction occurring in living cells. Prof. Hwa will describe how the growth laws can be used to make accurate predictions of cell behaviours without fitting parameters. 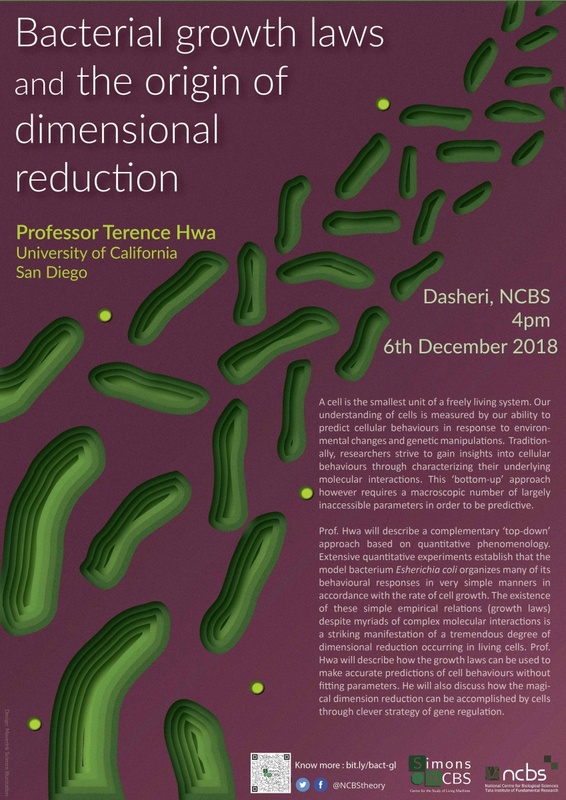 He will also discuss how the magical dimension reduction can be accomplished by cells through clever strategy of gene regulation.